On Louis The roux: He’s quiet, gangly and teases people into saying very odd things. Whatever he’s got, they should bottle it. 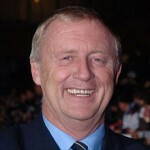 Christopher John Tarrant better known as Chris Tarrant, is a British radio and television broadcaster, known for hosting the ITV game show Who Wants to Be a Millionaire? between 1998 and 2014, the ITV children's television show Tiswas between 1974 and 1982, and as a Capital Radio host between 1984 and 2004.